As the design for Ciao Amalfi slowly transforms to a completely new look, this week’s theme for Foto Friday is dedicated to the bright yellow lemons that you’ll see in the new Ciao Amalfi logo created by the very talented Melissa Muldoon from Melissa Design. More about that in an upcoming blog post, but I just couldn’t resist sharing these lemons that I spotted peeking out from under their protective black net on a walk from Scala to Amalfi last week. 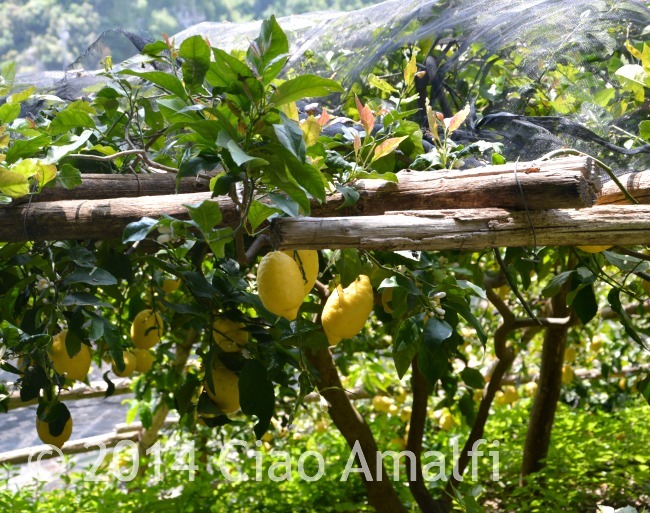 It’s lemon harvest time on the Amalfi Coast, and these looked just perfect to pick! 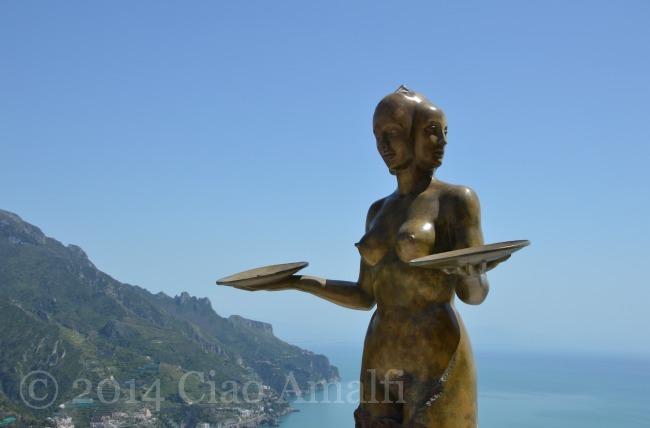 For those of you that love the Amalfi Coast, then you’ll enjoy this video featuring Pharrell Williams very catchy song “Happy” filmed in Amalfi. Like that one? 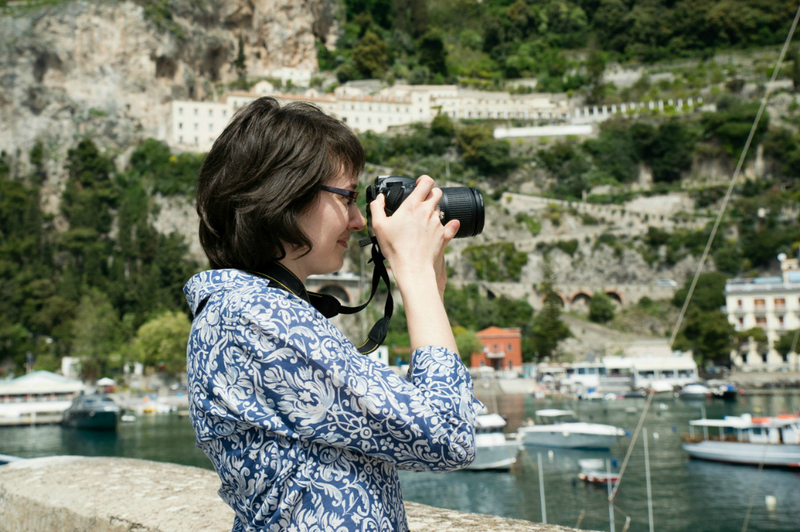 Check out the We Are Happy From Positano video and the Happy from Ravello video, too. Love all the enthusiasm and, well, happiness! 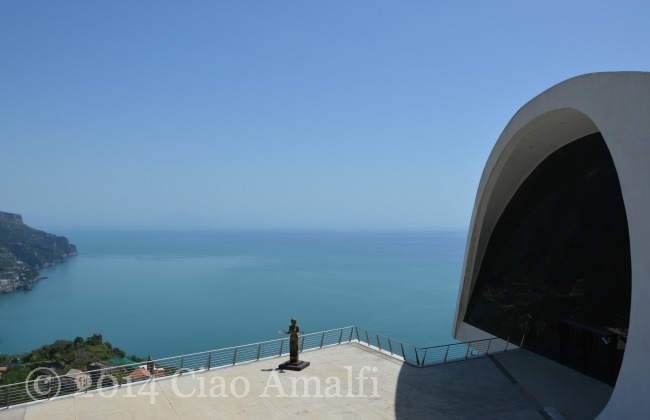 Following a twisty, narrow road down from the center of Ravello, you’ll find the striking Auditorium Oscar Niemeyer. 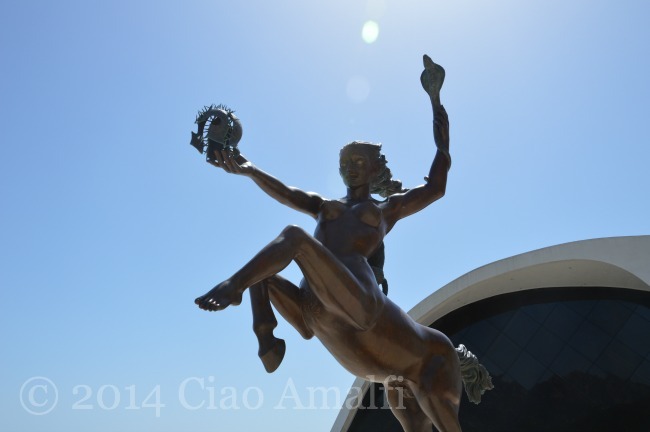 I enjoy its gleaming white curves and especially the piazzale with a sweeping view of the Amalfi Coast. 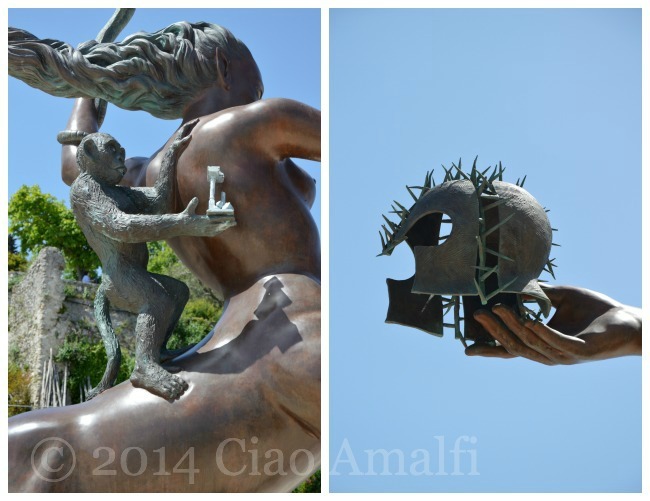 It’s the perfect spot to display large sculptural artwork, and I’m pleased to see another exhibition installed after the Igor Mitoraj show in 2012 and the memorable Mimmo Paladino show last summer. 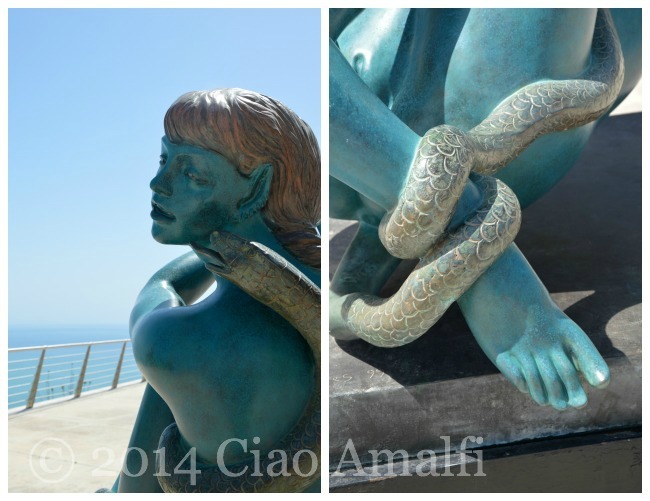 This spring the work of the contemporary Italian artist Alba Gonzales is on display at the Auditorium Oscar Nieymeyer and Villa Rufolo for the exhibit “Amor Maris – I Miti Scolpiti.” The exhibit brings together 32 works in bronze and marble surrounding the theme of modern mythology told through universal themes like love, death, justice and liberty. 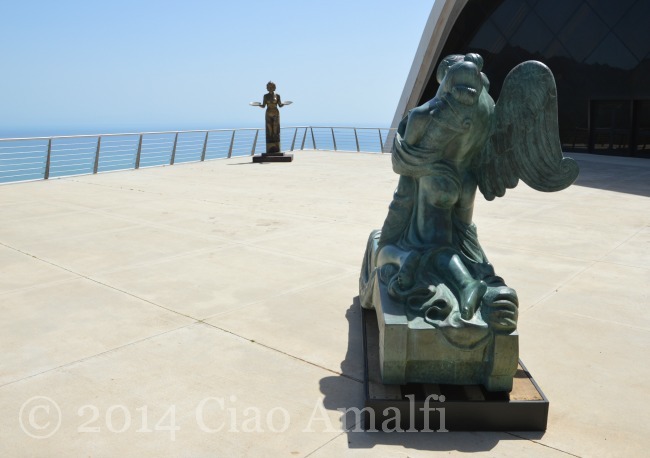 Strolling around the piazzale at the Auditorium Oscar Niemeyer, I was reminded how much I enjoy photographing sculptures. 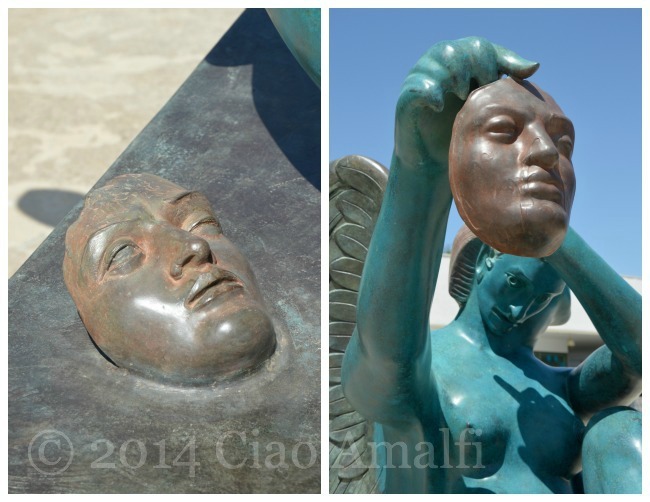 I found the large bronze pieces by Gonzales particularly intriguing since they all had multiple sides, scenes and stories to tell. 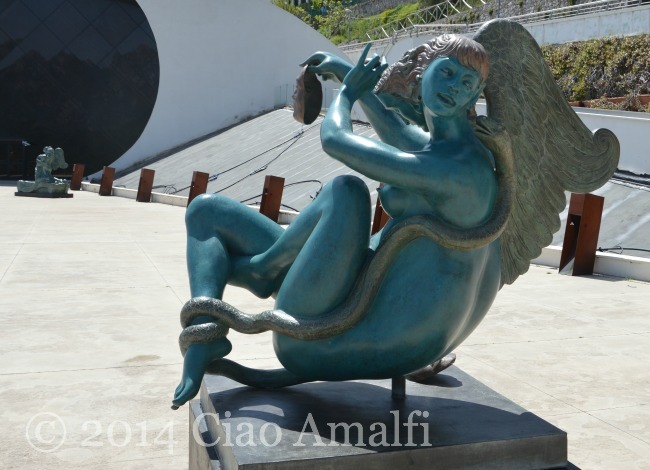 Amor Maris – I Miti Scolpiti is on display only until May 18th, so do take a scroll down to the Auditorium Oscar Niemeyer this month if you’re visiting the Amalfi Coast. To find out more about Alba Gonzales, visit www.albagonzales.it.